Saint Augustine's College in Raleigh was founded in 1867 as Saint Augustine's Normal School and Collegiate Institute for blacks. The school was created through the joint efforts of the Freedman's Commission of the Protestant Episcopal Church and a group of clergy and laymen of the Diocese of North Carolina. The normal school began operations early in 1868 in a facility lent to them by the U.S. Freedman's Bureau. However, before the year was over a new structure had been built on land owned by the institute. The school began to receive regular support from the national Episcopal Church by 1907. By 1928 it had evolved into a full four-year college, which graduated it first class in 1932. Harold L. Trigg was named the college's first African American president in 1947. Saint Augustine's College has remained committed to providing the highest quality education possible for its more than 1,800 students. The college continues to be closely associated with the Protestant Episcopal Church and seeks to develop the highest ethical and moral values in its undergraduates. The modern-day school offers degrees in 31 distinct disciplines and emphasizes student preparation for graduate studies and careers. Courses also include computer science, radio broadcast journalism, and physical therapy. Students come from 31 states, the District of Columbia, and 22 foreign countries. Saint Augustine's was the first historically black college to develop on-campus commercial radio (WAUG-AM 750) and television (WAUG-TV 68) stations. St. Augustine's College officially changed their name to St. Augustine's University on August 1, 2012. Cecil Durelle Halliburton, A History of Saint Augustine's College, 1867-1937 (1937). Thelma Johnson Roundtree, Strengthening Ties That Bind: A History of Saint Augustine's College (2002). "Saint Augustine’s College announces name and status change." Press release. Saint Augustine’s College. March 30, 2012 http://www.st-aug.edu/saint-augustines-college-announces-name-and-status-change-449.html (accessed March 8, 2013). 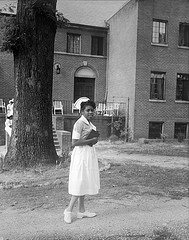 St. Agnes Hospital Nursing School, St. Augustine's College, Raleigh, NC, 1949. From the Albert Barden Collection, North Carolina State Archives, call #:N.53.15.6823. Available from http://www.flickr.com/photos/north-carolina-state-archives/2655849340/ (accessed June 6, 2012).